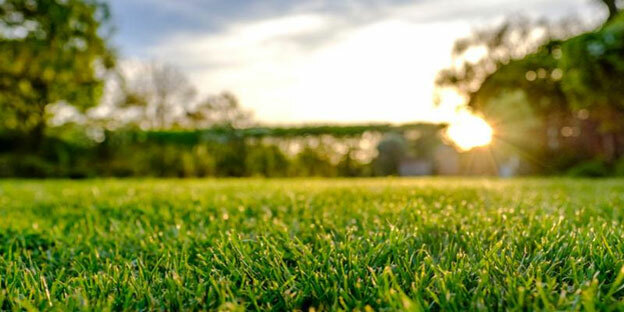 So keeping these facts in mind, we will show you a few solutions as to how to integrate lawns into your home’s landscape whilst reducing the lawn’s footprint which in turn will lower water consumption and help reduce the overall maintenance. The idea here is to reduce the footprint of the lawn whilst we let it shine. 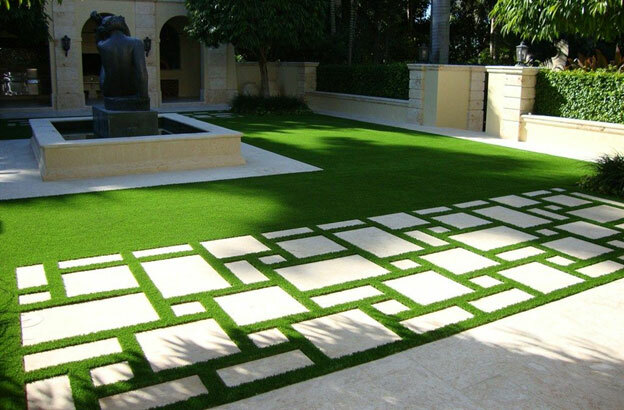 A great feature of lawn grass is the fact that it combines well with other materials like tile and stone. There are several species of grass that grow well in Indian climate, so don't restrict the design to just lawn grass. Mondo grass (Ophiopogon japonicus) is the grass used on the left side of the pathway in the picture above, it is more textured and is a great option for smaller patches. Buffalo grass (Bouteloua dactyloides) is another great alternative to the lawn grass; this is a shade tolerant grass that has a slightly thicker blade size as well. It may be used in shady areas around your yards to add an extra textural interest to your landscape. The third and final and most common is Bermuda grass (cynodon dactylon) which is a long living perennial green grass that thrives in most soils. In the above picture it is the grass we see to the right of the pathway. Using different grasses is not only the right move to save on maintenance, but it is a great way to spruce up a unidimensional look with adding variants in texture and colour. Stones are laid out in a grid, with grass in the joints instead of grout, which is a great way to accentuate the stone tile while still maintaining an element of green. This is the most commonly used method and the grass used here should be fine textured. Another design is a very eye catchy look with stones that are rough and out of shape; this irregular design is cut to blend into the environment yet keeping its subtle rustic design. For such designs, keeping the rustic theme in mind opt for a more textured grass. There are many ways to use grass in the place of grout but make sure you use it where there is foot traffic and not vehicular traffic, such as driveways. In places like driveways, concentrate the grass in-between where the car's tires may land. For a well-designed maintenance free outdoor composition, patterns are created with opulent grass works that blend effortlessly with flooring materials like wood, tiles and concrete pavers to create intricate landscape designs that are one of a kind. Not only is it easy to maintain, it creates a warm atmosphere between the architecture and nature. Patterns are a different ball game all together, because this design gives you the flexibility to play with the thickness of the lawn space vs the hardscape. Opt for a beautiful asymmetrical design if you want to play up the ratio of green vs non-green. There is more wastage in organic designs so you may choose to go for a geometric design that gives you pathways to walk amongst the grass. The design for patterns is traced onto the ground, then the tiles or stone are laid and later the grass is placed in squares on the rest of the place. 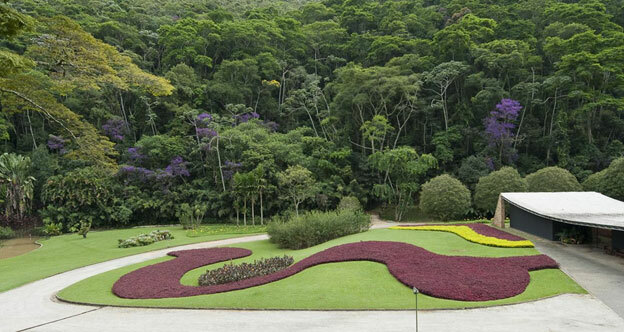 Patterns may also be used along with grass, and other ground cover along with hardscape. This ensures there is more visual interest. As shown above, Hybrid eranthemum or Wedelia trilobata may be used along with grass to create patterns. Another solution as to how to integrate lawns into your home’s landscape is to set boundaries and demarcate where the lawn shall be located. This will help in reducing the lawn’s footprint which in turn will lower water consumption and help reduce the overall maintenance. Due to the allure the colour green has on us, the extent of the lawn doesn't actually need to have a huge footprint. Locate the lawn in a central focal point area where it can get the most exposure sight wise. Make sure the lawn has a healthy size that does not let the hardscape overpower its presence. Strategically position the grass in places that are centrally located. 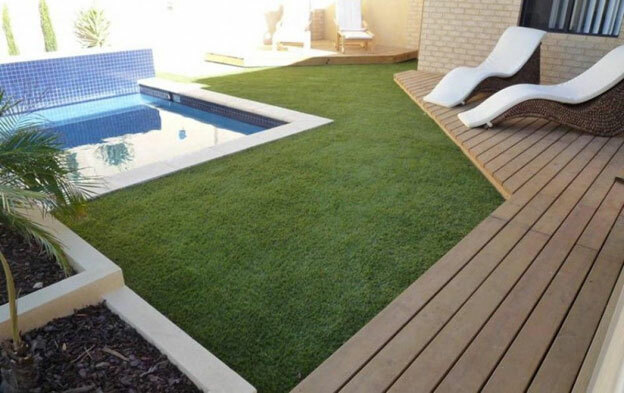 This is a great idea for terrace gardening, because you can position the grass along with deck areas and other functional areas surrounding the green. Ensure that there is an element of green is a huge part of the aesthetic of any good home landscape. 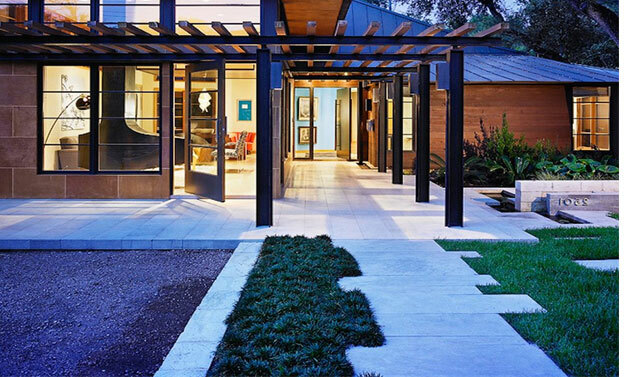 More over lawns are the ultimate expression of green in homes. Just because of our weather conditions or our water scarcity, we don't need to sacrifice lawns. Make sure you choose the right formula to limit the overall footprint while enhancing the elements you would like to.